I’m going to be loaning my Windows PC laptop to my brother but don’t want him to mess with all my files. 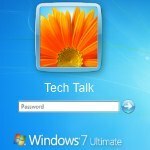 I know that Windows 7 supports multiple user accounts because I obviously log in to get to my own. How do I add a new account for him to use?